This film has only been out for a couple of weeks in the UK and it has already won 16 international awards and has a further 27 nominations pending including the BAFTAS and the Oscars. Gary Oldman's performance as British Prime Minister Winston S Churchill during the dark days of May 1940 has been widely praised and on several occasions been described as 'career defining'. There are other strong acting performances too, notably from Kristin Scott Thomas (Clemmie), Lily James (Miss Layton), Ben Mendelsohn (King George VI) and Ronald Pickup (Neville Chamberlain). The demands of office - whether appointed or inherited. Courage, sacrifice and having to choose the least worst option. The way in which war creates the need for different rules. It is certain that Churchill possessed many character traits which rendered him difficult to live with - even for his family! History also records he made several decisions which were costly in terms of human life earlier in his political life, the saddest example being the Gallipoli landings of WWI. Could anyone else have galvanised the support he inspired and led Britain to victory with her allies five long years later? In terms of pure political opportunism and the ability to read the mood of the nation, few can even draw near. Can politics ever be pure or by necessity are manoeuvring, manipulation and the strongest hold on one's principles, however unpopular they may be, all prerequisites for political success? I'm afraid Neville Chamberlain does not come out this film well, being portrayed as weak, indecisive and even at the last unable to make a stand. No sooner had the film started than it was over! Never have I known two hours and five minutes pass so absorbingly. For a huge amount of film Oldman's prosthetically enhanced face fills the screen - usually through a veil of cigar smoke. The likeness is stunning but Oldman's strongest acting tool, his hallmark eyes, always betrayed the transformation for me. The voice, mannerisms and pout are the very best examples of a character study available. Oldman's performance is hugely compelling and worthy of the accolades showered on him by critics and public alike. Despite Churchill's best attempts to alienate himself from everyone through his behaviour, smoking and drinking, there are a surprising number of tender moments in this film. 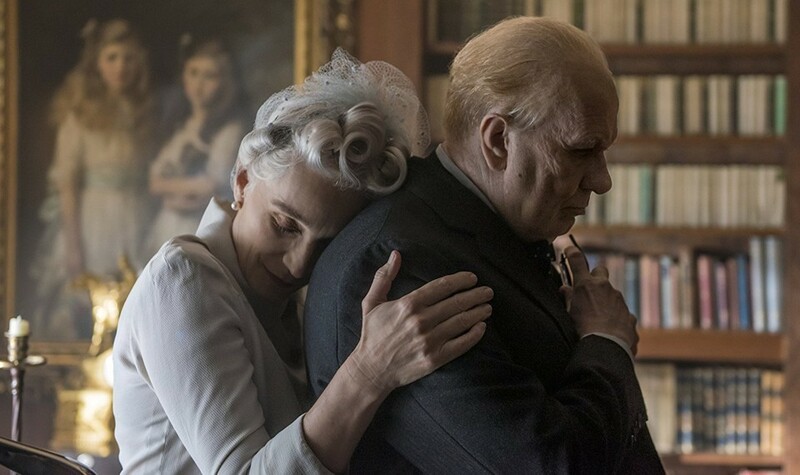 Scott Thomas' performance is nuanced and sympathetic, Churchill's relationship with his longsuffering typist Miss Layton shows mutual respect and understanding. Even King George VI comes around to a more sympathetic relationship. Whilst Churchill's self-declared desire to be Prime Minister began whilst he was in the nursery, the Churchill we see here is driven by the demands of office and public service, and not by selfish gain. He is prepared to hold out against the tyranny of fascism and if need be, to go down all guns blazing in a final show of defiance rather than to be subjected to Nazi rule. This film highlights the moral dilemmas facing leaders in times of war and conflict, and how no choice looks like a good option. Several times throughout the film we see Churchill wrestling with his inner emotions. No doubt historians will debate some of the accuracy of the finer points of the script and the meetings that took place, but there is no doubting that in the nation's darkest days "Commeth the hour, commeth the man". I watched Dunkirk only two weeks ago - these two films would make a great double bill and I wonder that if they had been released early in 2016 whether or not the Brexit vote might have been more decisive! Is this film worth seeing - YES! Is Oldman's characterisation all it's reported to be - YES! I'll give it 9/10. Please go and see it.